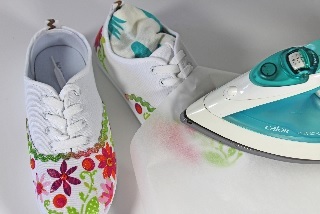 606 enables adhering permanently onto fabric after ironing for 45 secondes on cotton setting. Glues fabrics, appliqués, badges, ribbons... Can be washed on warm setting (40°C) and dry cleaned. Fabric, Canvas, Non Woven, Wood, Picture Frames. 1. Pre-wash fabric. Protect work surface. Shake can vigorously. 2. Spray evenly from 8 to 10 inches in short spritzes. 3. Be sure to spray edges. 4. Wipe nozzle if needed. Place item in desired location. 5. Cover with parchment paper or teflon sheet. 6. Iron on high setting 45 seconds, always moving iron. Can be used on fabric, appliques, badges, ribbons. May be washed on a warm setting (40C) and dry cleaned. For your security, use only for its purpose and in accordance with the instructions. Protect from sunlight. Do no expose to temperatures exceeding 50 °C/122°F. Manufacturer cannot be responsible for dangerous storage conditions or misuse.